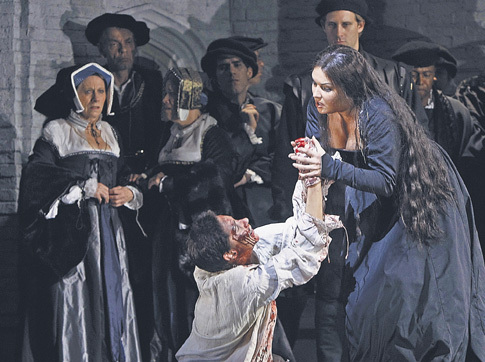 Blame director David McVicar for the overall listlessness of this production, his mise-en-scène notably lacking in inventive movement or creativity in handling crowd scenes: This accounts for drawn-out moments when courtiers file onstage and off, shuffling drearily into and out of the wings like 16th-century factory stiffs. Often, they stand limply around, densely packed on one plane of the two-dimensional set, with its dun-colored stone walls and stark black-and-white interiors. Historically accurate though it may be, the scenery (by Robert Jones, with murky lighting by Paule Constable) offers little in terms of propelling audiences into the intrigues of the Tudor court. As a backdrop, it serves only to delimit the playing space; more often than not, it just gets in the way. Contemplating this season opener, it seems almost as if the Met had retreated from its daring new productions of “From the House of the Dead” as well as the overdone (often dangerously so) “Ring” (with Cirque du Soleil’s Robert Lepage in unbridled gimmicky hilt), opting for a style indicative of decades long past, when a more staid presentation ruled. Has impresario Peter Gelb simply tired of risk this year, editing the slate to a bunch of traditional warhorses (including two more Donizetti works) that will draw the old-time crowds (and their lucre)? Barring Netrebko’s winning presence, this insipid production feels as if that were so: Gelb thumbing his nose at the old guard with one hand while holding the other one out to receive their gold.